The first thing you noticed about the 2011GreenBuild International Expo is the scale. 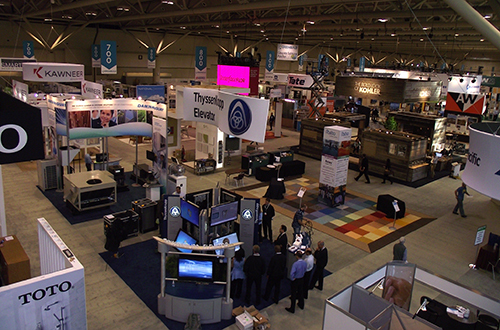 Displays and exhibits covering virtually every aspect of green building, energy efficiency and sustainability filled two giant halls in the beautiful Toronto Convention Centre. XLERATOR: It’s a hand drier on steroids that qualifies for LEED credits. It dries hands in 10-15 seconds with a high burst of air, uses 80 percent less energy than conventional dryers and purportedly represents a 95 percent cost savings versus paper towels. We were impressed with the “hurricane” forced air alternative to the typical process of waiving hands under a weak stream of heated air and then drying them off on your trousers. 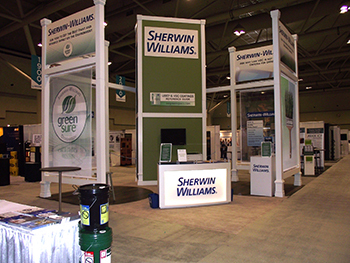 SHERWIN-WILLIAMS: One of the oldest names in paint introduced its new Pro Industrial Zero VOC Acrylic. It is an almost odorless acrylic with no VOCs. It also offers superior stain and corrosion resistance, fast drying times and is GreenGuard Indoor Air Quality Certified. CORIAN: The solid surface counter tops by DuPont are new again. They look great, achieve sustainable design through the use of recycled resin content and according to the company do not support the growth of mold or mildew when used properly. SYBTHEON: Elemix’s concrete additive is engineered for sustainability. The Elemix additive creates a lighter weight product that is designed to deliver several key improvements to the physical characteristics of concrete including resistance to cracking and fire, ease of placement, and durability to freezing and thawing. 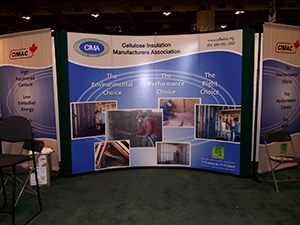 CIMA was also on the expo floor joining forces with CIMAC (Cellulose Insulation Manufacturers Association of Canada) to share the “greenest of the green” cellulose insulation message. We at the Greenest Insulation Blog support the efforts of GreenBuild and encourage everyone who shares our enthusiasm to join the organization and support sustainability. If you can, plan on attending the Expo in San Francisco Nov. 14-16, 2012 where we know more great innovative products will be on display.